Keeping a home organized and clutter free is harder than it sounds and seems to be an ongoing challenge for most of us. My organizational lifestyle seems to ebb and flow with some very widespread oscillations. In other words, there are months when I can keep my house OCD organized and then I’ll totally fall off the wagon for the next few months and I’m lucky if I can find the electric bill in time to pay it before they turn the lights off. Hopefully you’ll understand what I mean when I say this, otherwise I’m going to be pretty embarrassed having just made this confession. 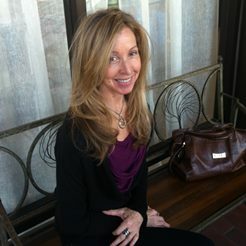 So if you’re on board with me about suffering from organizational distress, you’ll understand why I’m always on the hunt to discover new dual use home furnishings that are designed to be functional and also to make it easier to stay organized and out from under all the clutter that inevitably builds up. 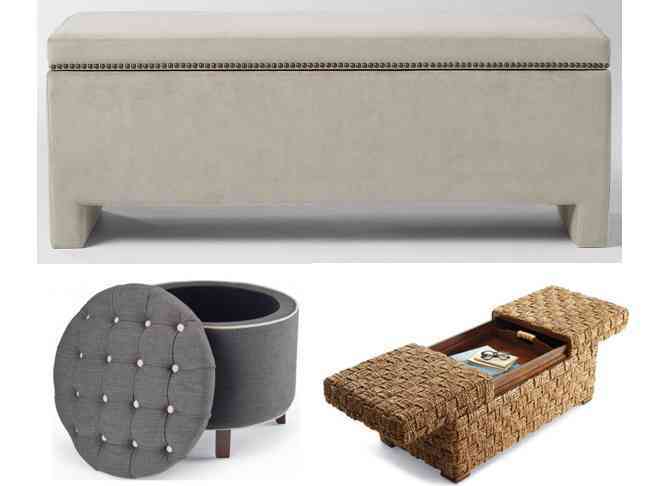 Storage benches and ottomans have become my latest storage obsession for the obvious reason that they serve a dual purpose, without taking up extra space or adding to your budget. 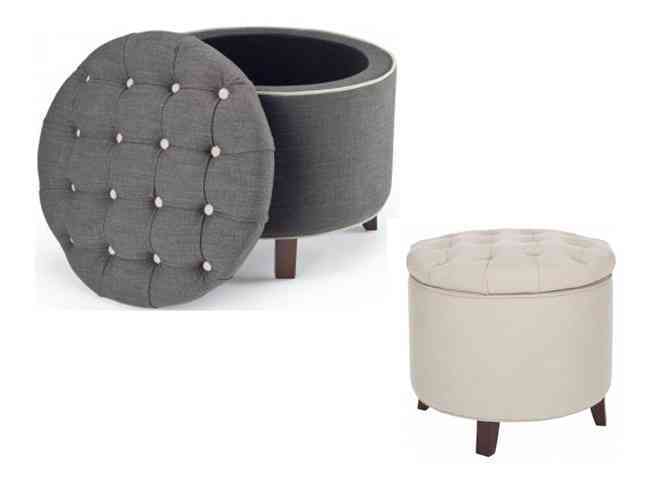 You’ll find both of these qualities in this Amelia Tufted Storage Ottoman shown here in charcoal with contrasting tufted buttons. It’s circular shape and 21” diameter make it just perfect as an accent seating piece or it can easily be used as a footrest too. Just pop off the lid and inside you’ll find the perfect place to store extra shoes, hats or pillows. So now you don’t just have a great place to sit, but you’ll also have a place to stash more shoes….yay! And if the charcoal color doesn’t work for you, it’s also available in a classic cream tone, too. Do you have a favorite place in your home where you like to curl up and read or does your family room need a place to store those always disappearing television remotes? 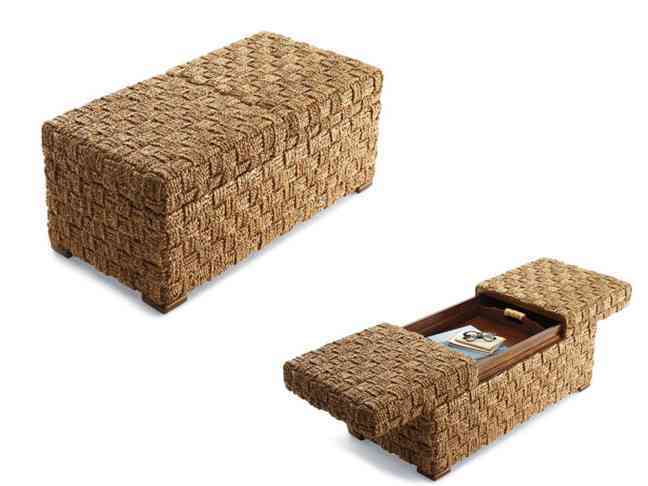 Then this Andros Sliding Trunk may just be your perfect solution. It’s exterior is constructed of a hand-woven seagrass that gives it a warm coastal look with a rich espresso-finished interior. When you slide the sides open there’s a removable tray inside that will hold those small items that always seem to disappear when you need them….like eyeglasses and remotes! When you invest in a piece like this Nailhead Upholstered Storage Bench you know there will be a dozen different places you’ll want to use it. First you’ll need to choose between a nubby charcoal Microfiber or a Velvety Stone Colored upholstery fabric. Next you’ll have to decide whether you want it to go at the foot of the bed or take a more prominent position in your entryway. Then once you get all those thing situated, then you can figure out if it’s location makes it more suited to storing blankets and pillows or all your family’s shoes that get dumped in your entry.